We have an exciting new schedule that is sure to get you moving and get you strong, We have a diverse membership from novice to competitive athletes who all share similar goals. Learn. Train. Stay healthy. Get strong. We have introduced Team Blast 90 which is essentially the ultimate wake up workout. Train fast and hard, while building strength,cardio capacity,and incinerating calories. 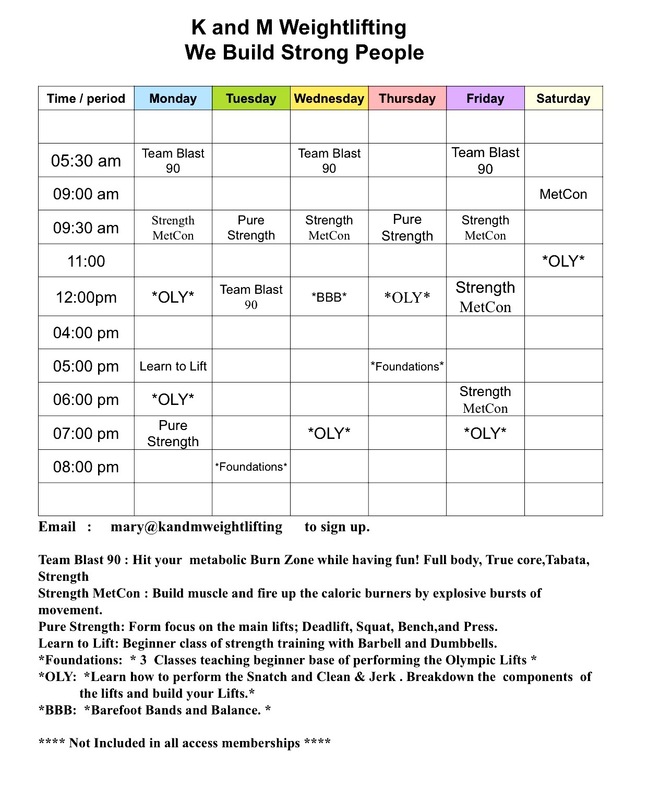 Also, introducing a new Foundations class that will teach the basics of Olympic Weightlifting. When your ready, you switch to the OLY class. BBB is the exploding new field of waking up and syncing the human body to optimize performance in all phases of life. Barefoot Bands & Balance makes all the dots connect and you can immediately feel these connections working. February is a cold, dark and dreary month. This is the best facility to accomplish your goals. Get energized and excited about your workouts. Join K and M Weightlifting member and be the best you can be. We Build Strong People. Just show up…… that’s the hard part.